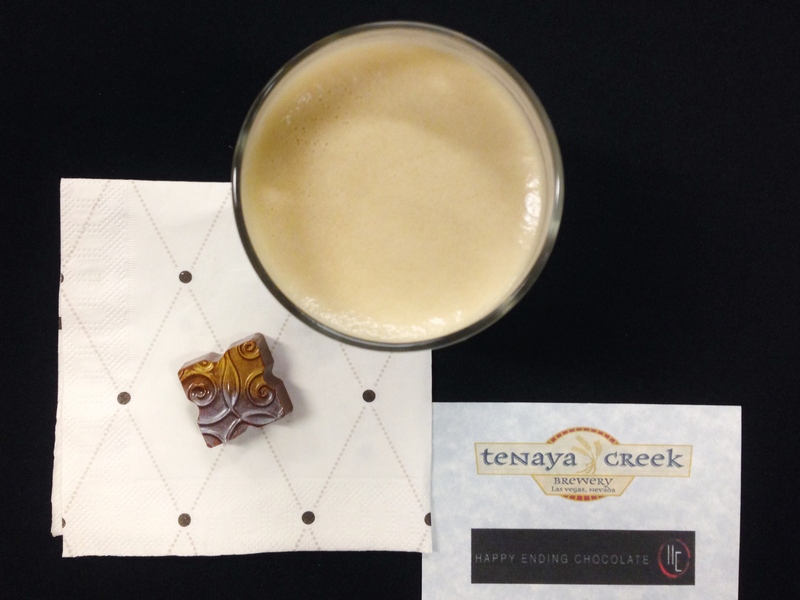 Raise your hand if you were at the beer and chocolate pairing event with Happy Ending Chocolates at Tenaya Creek Brewery. If you didn’t raise your hand just now, go ahead and slap yourself for missing out on an incredibly fun evening enjoying delicious beers and chocolates specially prepared for the event. Match intensity: If you have a beer with a strong flavor, than it should be paired with a food that has an equally strong flavor so that neither overpowers the other. Match the flavors: Pick a beer that has the same flavor characteristics as the food i.e. dark roasted malts in a beer paired with dark roasted foods. Contrast the flavors: Choose a beer that is the complete opposite of the food. A perfect example of this is a stout used in a vanilla ice cream float. Below are my tasting notes for the pairings that we had. Chocolate: Creamsicle- a blend of milk and white chocolate infused with orange zest, encased in milk chocolate. Tasting Notes: Very rich orange flavor in the chocolate. Xenon mentioned that it’s made with reduced orange juice. The orange zest used in the chocolate matches the bitter orange peel used in the beer. Chocolate: Island Girl- semi sweet chocolate with pineapple caramel, topped with salted li-hing. Tasting Notes: The tropical fruity sweetness in the chocolate goes very well with the fruity hop aroma. The caramel brings out the residual sugar from the IPA. The bitterness in the beer balances out the sweetness in the chocolate. Chocolate: Hugs and Kisses- peanut butter gianduja layered above a hibiscus and mixed berry jelly, in a dark chocolate shell. Tasting Notes: The beer isn’t overpowering with raspberry, and it isn’t sweet or sugary. Instead, there is more of a raspberry flavor than a raspberry sweetness. 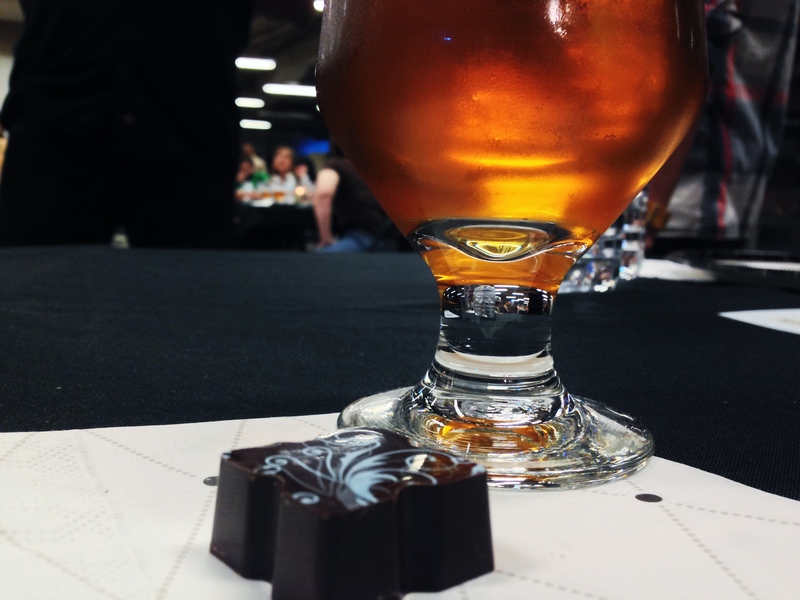 The chocolate contributes the sweetness in this pairing with the beer enhancing the berry flavor. The peanut butter and dark chocolate contrasts the fruity flavors in both the beer and the jelly. 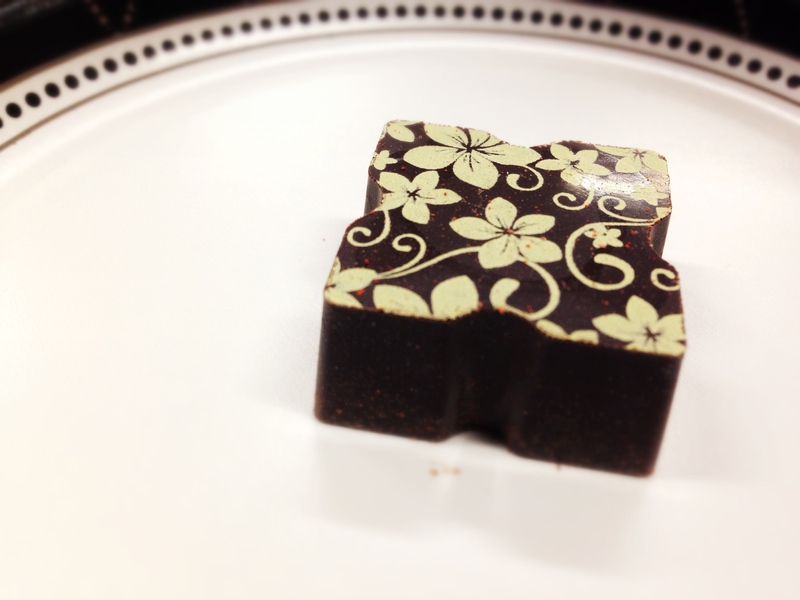 Chocolate: Fuego Azul- 66% dark chocolate filled with a habanero infused ganache. Tasting Notes: The chocolate is very dark and bitter. The spiciness from the habaneros doesn’t show up until the aftertaste, and then it lingers for quite a while. Hop bitterness in the IPA really accentuates the spiciness. The dark chocolate helps to mute some of the spiciness and keep the pairing very enjoyable. Chocolate: Signature- white chocolate shell filled with a contrasting dark chocolate and butterscotch ganache. Tasting Notes: This was probably my favorite pairing of the evening. The beer has a strong coffee aroma and the flavor carries some of the astringency from the coffee beans. 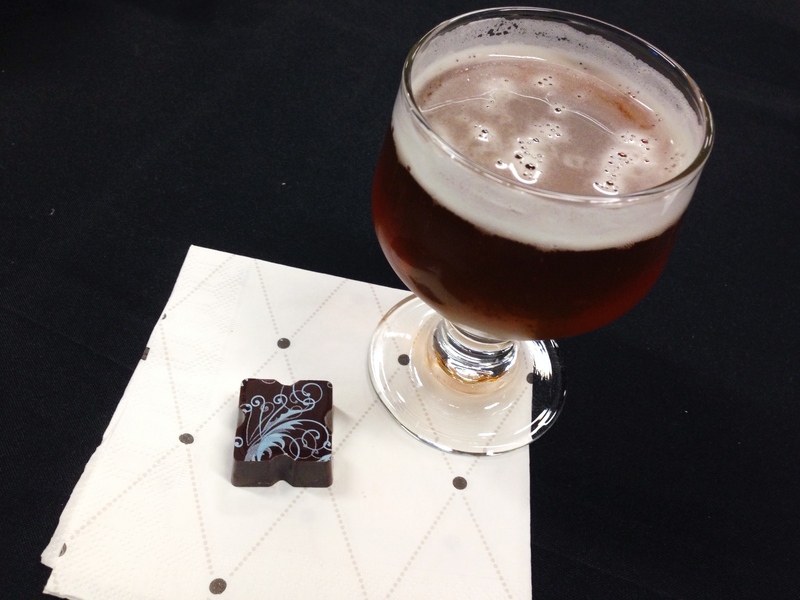 The dark chocolate matches the dark roasted flavor of the beer. The white chocolate serves as a stark contrast to these flavors and as a sort of “cream” for the coffee. Chocolate: Two-Tone- 40% rich milk chocolate with a caramel ganache and a hint of vanilla and aged rum, topped with sea-salt. Tasting Notes: This beer is incredible. It has a smooth, creamy body and a balanced oaky flavor. The rich chocolatey flavor stands up to rich malty flavors. The aged rum matches the booziness of the beer. The salt compliments all of these strong flavors by providing strong contrast. 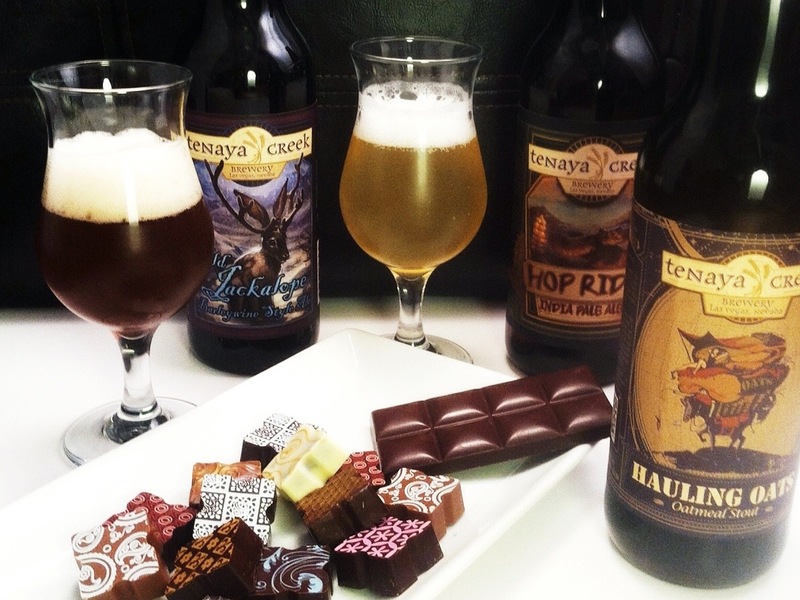 Tenaya Creek beers are pretty much available everywhere in Las Vegas now. The brewery also serves as an excellent bar. Happy Ending Chocolate can be purchased online at their website here.